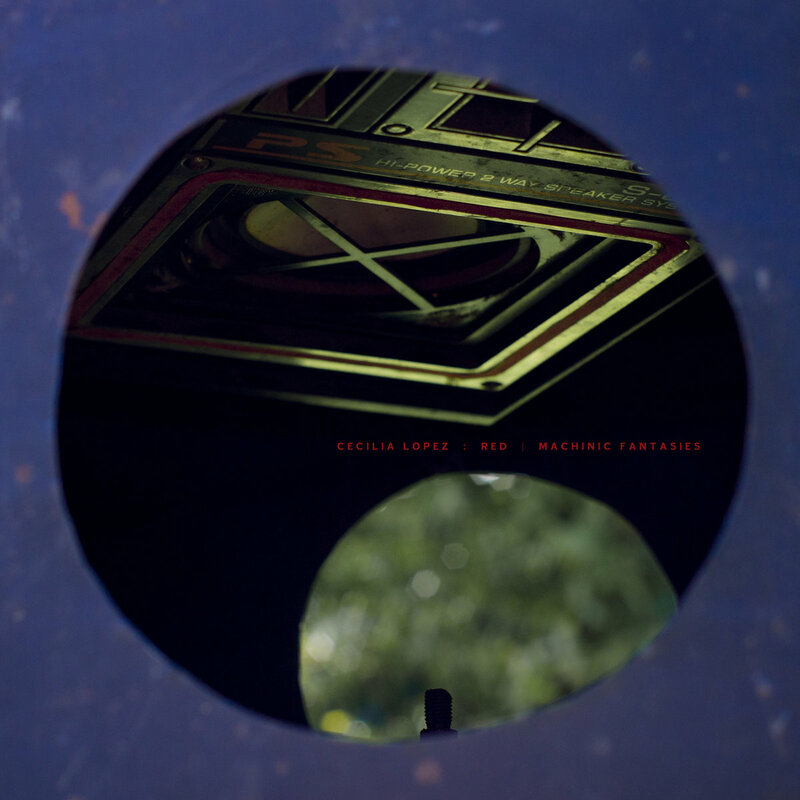 I put on Cecilia Lopez’s Red / Machinic Fantasies as I change a light bulb in a flood-light, dangling from its wire on a ceiling pipe. The snow has turned into rain and the black night outside is cold and angry. I include this in describing the opening of Lopez’s album (released December 16th) as the “tone” seems similar. Just as the harshness of the light bulb hits my face directly, sharply contrasting the darkness beyond the window, Lopez pierces the listener with raw, cutting sound. This does not begin immediately. She makes us wait a few minutes into the track until we hear faint movement building like a static noise, gradually increasing. This reminds me of poor reception on a car radio; it changes as you drive but the connection isn’t quite clear. You listen anyway, waiting until you can decipher something. After about twenty minutes, “Desastres Civiles” fades out. It moves further away until it is gone entirely. The opening of the following track sounds almost spiritual after “Desastres Civiles”. The tone is brighter than Lopez’s first song and I am deceived into thinking this will continue throughout its entirety. I feel this way until I am a minute into the track and the buzzing then becomes numbing. I suddenly feel hollow, like the noise coming through is playing to an empty room. Lopez creates sound that merits focus and concentration to understand what sounds like carefully crafted gestures. “PP” demonstrates Lopez’s attention to sound as an artistic medium. It is nothing like the previous tracks and bring my mind to a scene in a shed or garage. “Tools” are running, though I do not envision any people powering their movements. This contributes to the overall feeling of isolation and slight disturbance on the album. “PP” is not particularly pleasurable and forces me to endure sounds which remind me of the years I spent watching too many horror movies. Of course, I am intrigued and paying close attention to what will come next. The following, “Larga Distancia” is reminiscent of the end of a show. The kind where electricity seeps out of speakers; entangled in a fit of rage and vibrating. I feel like I am at a local punk show back at home. The crowd is small and loyal and stays to hear the lingering charge of the music, sticking to the walls and causing heart rates to stay elevated, even after the set is over. A long note fills the first few minutes of “Sin Batería”. It begins as one individual sound and stretches throughout the length of the track. This steady “flatline” pulse is consistent, though accompanied by other odd and impulsive noises. At 2:25 the sound manipulation even resembles a squealing animal or loose and rusty wheel spinning freely. Though these elements are not remotely comparable, this makes evident Lopez’s ability to distort sound in a unique way. The final, “Machinic Fantasies” is an amazing hour (plus) long “song”. This feels more like an exercise in abstract expression, however, and if I close my eyes I feel the movement Lopez creates in the first few minutes. The motion we feel, as listeners, breathes in and out like a human body, though this track feels very much mechanic and automated. The sensation is drawn out, perhaps to increase the immersive affect. Lopez engages our bodies and our minds at each point in “Mechanic Fantasies”. Around 45:00 an angry sorrow screams through the speakers. It is as if we are communicating with whatever technology is interacting with us. It sounds deeply aggravated and in pain. Lopez leaves the listener in a kind of haze. Something has been expressed, but we are unsure of where this violence has come from.